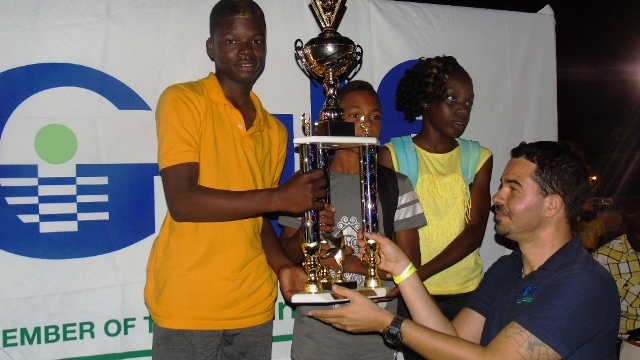 NIA CHARLESTOWN NEVIS (APRIL 01, 2016) — The St. Thomas’ Primary School walked away with the championship trophy in the “A Division” while the Elizabeth Pemberton Primary School (EPPS) won the “B Division” trophy for the fifth consecutive time at the 24th Gulf Insurance Inter-Primary Schools Championship. The event was held on March 30, 2016, at the Elquemedo T. Willet Park. Eight primary schools competed in this year’s sports event. They were divided according to the number of students on the schools’ rolls. Those with more 125 students were placed in Division A and those with less than 125 students were placed in Division B. 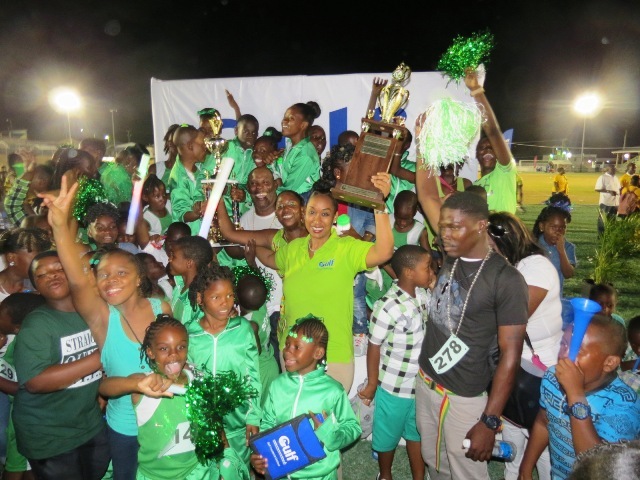 In the end, the points in Division A were St. Thomas’ Primary School: 182, Ivor Walters Primary School: 159, Charlestown Primary School: 153 and defending champions Joycelyn Liburd Primary School: 117. In the B Division, the EPPS amassed 152 points, Maude Crosse Preparatory School: 51, St. James’ Primary School: 32 and Violet O. J. Nicholls (VOJN) Primary School: 18. 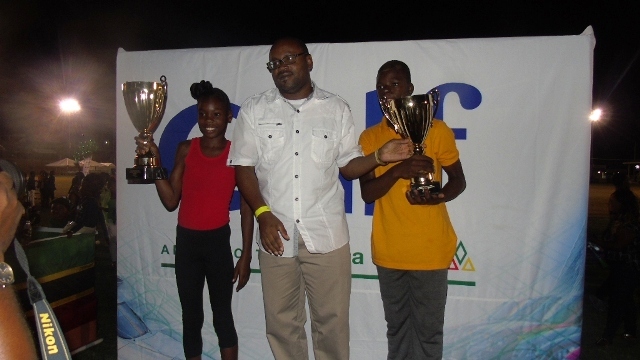 Queleel Roberts of the EPPS and Tiana Liburd of the St. James’ Primary School were awarded for their best individual performances which were not based on the points criteria. Meantime, coach of the St. Thomas’ Primary Emmanuel Richards told the Department of Information that the school was proud of its victory. “The children worked real hard to achieve this milestone. We had outstanding athletes – the Grade 6 girls, Grade 2 boys and Grade 1 girls as well. All in all the children did well,” he said. Richards thanked the school’s principal and staff, sponsors the St. Kitts-Nevis-Anguilla National Bank Ltd., other coaches Jasmine Charles who is attached to the school and Collin Stapleton a former student and their supporters. After their victory, Coach of the EPPS Adelvin Phillip said that with a team of 32 athletes, their level of performance was in line with the other schools competing in Division A. He explained that with the exception of a few errors in baton passing during the relay races and some nervousness their athletes performed creditably. Phillip said he plans to strengthen his team for next year’s championship and hopes to get more support from the community with training the athletes. 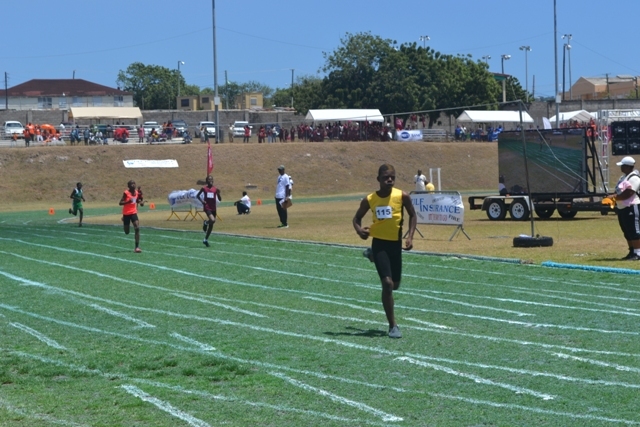 A bystander stated that the performance of the Charlestown Primary School was consistent because although they did not place first in many of the races, they always placed in the top three positions.